Later on, the prints were sold separately, and the first of them had added title and subtitle (picture to the right). The scene with the senator lacks the little devil; and the scene with the peddler lacks one of the cadavers. 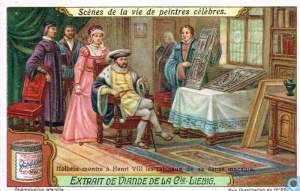 The pictures are copies of Holbein and not — as might be assumed — of Hollar. This can partly be seen from the fact that Death attacks the soldier with a bone instead of an arrow, and partly because the 19 prints include four scenes, which Hollar didn't make: ossuary, lawyer, fool and blind man. The prints are in the words of Francis Douce: »nineteen very indifferent etchings«. The only reason they are worth mentioning is the importance Douce gave to the book's preface, and the extensive discussion it has caused, and which I will try to summarize. 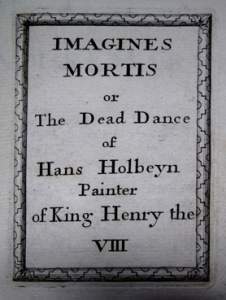 In the handwritten preface — which is different for each copy — the author seems to claim that Holbein had painted the dance of death on the walls of Henry VIII's palace in Whitehall, which burned down in 1698. 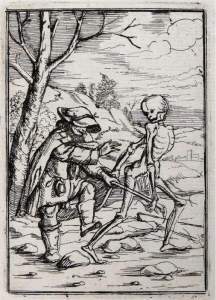 Holbein presenting his dance of death to Henry VIII. 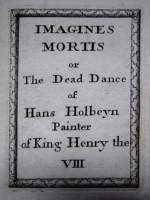 So Douce has seen two copies of this book, in which Nieuhoff writes that Holbein had painted the dance of death, life-sized, on the walls of Whitehall. This book is the last exhibit in Douce's evidence for his favorite theory, viz. that Holbein is not the originator of the famous woodcuts: »it is to be hoped that no additional evidence will be requisite to shew that Holbein did not invent the subjects, nor execute the cuts belonging to the Dance of Death, which is usually ascribed to him«. Hegner calls the story "a fable", which he mentions only because of the undeserved weight Douce has attributed to it, and the undeserved confidence that Douce's superficial art research had found among English and other compilers. Hegner uses the story as a general warning against baseless information. It would require a separate book to describe all of the half-true, false and misleading things written about dances of death. 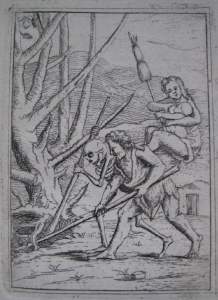 In 1833 Douce published his famous book, The Dance of Death Exhibited in Elegant Engravings on Wood. Nieuhoff's book is described briefly on page 130, and on page 140 Douce returns to the handwritten prefaces. Now Nieuhoff has acquired one more name: Piccard, and Douce has now seen three copies of the book. However he still describes only two of them. Here in 1833 Douce gives an actual quote from Nieuhoff, and as one can see Nieuhoff doesn't claim to have copied the dance from the walls of Whitehall. On the contrary he says — more or less — that he has simply copied a printed version of Holbein's woodcuts: »the little work which he has engraved with his own hand, and which I have copied as near as possible«. Douce himself had come to a similar realization: »For his greater convenience, he appears to have preferred using the wood engravings instead of the paintings«. The 19 engravings then cannot be used as evidence. The only information about the alleged painting is what Nieuhoff writes in the preface, and nobody knows, who he was, when he lived, or whether he had seen the painting. At the end of the book (page 240 ff) Douce informs us that he has recently read the book by Hegner, and he is not pleased. Douce refers to Hegner as "the above gentleman" with "gentleman" in italics; Douce uses several pages on lambasting Hegner's book, which is, »greatly abounding in error and false conceit«, while Hegner himself is, »wholly unqualified, and with much unseemly arrogance, and its usual concomitant, ignorance«. In the middle of his five-pages broadside against Hegner, Douce gives a sort of admission: »The identification of William Benting must be left to the sagacity of others«. Benting was the man to whom Nieuhoff had dedicated one of the books, and Douce would naturally have been expected to inquire the current owner about the provenance of the book — i.e. who had owned the book previously, and from whence it came. Chatto doesn't pull his punches. He doesn't believe that Benting (the owner of one of the books), ever existed: »and there is not the slightest reason to believe that a Lord William Benting, born in the old palace of Whitehall, "Lord of Rhoon, Pendraght," &c. ever existed«, and the same thing goes for his two villages: »neither Rhoon nor Pendraght are to be found in Flanders or Holland«. In the index Benting is even called "a fictitious character": »Benting, William, Lord of Rhoon and Pendraght, a fictitious character, mentioned by T. Nieuhoff Piccard«. Chatto thinks the prefaces are a clumsy attempt to swindle: »I am of opinion that the addresses of the person calling himself T. Nieuhoff Piccard are a clumsy attempt at imposition«, and Douce is criticized for his blind faith in a man who might not even exist: »he believes, on the sole authority of one T. Nieuhoff Piccard, whose existence is as doubtful as Macaber's, that Holbein painted a Dance of Death as large as life, in fresco, in the old palace at Whitehall« (page 406). ome parts of the discussion are easy to settle. It might be that neither Douce nor Chatto were able to identify the William Benting, who was born at Whitehall, but today it doesn't take many split seconds for Google to find Willem Count Bentinck, born at Whitehall in London, 1704, dead in 1774, Lord of Rhoon and Pendrecht. Chatto criticizes Douce for not telling in what language the two dedications were written: »It appears that these addresses of Piccard were written in a foreign language, though, whether Dutch, French, German, or Latin, Mr. Douce most unaccountably neglects to say: he merely mentions that his extracts are translated«. But this is wrong: Douce wrote in 1794 that the text was written in Dutch: »with manuscript dedications in the Dutch language«. And the book does indeed exist, for a copy was put up for sale on the Internet in March 2012. In this copy a former owner has written an extract of Douce's article from 1794: »It has entirely escaped the knowledge of all the biographers of Holbien [sic] that he painted a Dance of Death in fresco upon the walls of the palace of Whitehall which was consumed by fire in 1697. This curious fact is ascertained from 2 sets of nineteen etchings from the wooden cuts by one Nieuhoff«. The owner has discreetly omitted two words, for Douce had written, »nineteen very indifferent etchings«. The owner further informs us that this copy was dedicated to »Mynheer Kousemaker, a man of great wealth who came over with King William the 3(rd), and settled in Surrey«. When all is said, Chatto is still right in much of his criticism. It ought to have been a small task for Douce to identify William Benting simply by asking the owner of the book, from whence he had the book. At the same time the identification of William Benting weakens Douce's case: It is true that Benting was born at Whitehall, but this was in 1704, six years after most of the palace had burned down. Thus Benting had never seen the painting in question. Both Chatto and Hegner also point out that lots of art experts had visited the palace: Mander, Sandrart, Patin and Vertue, and none of them mention such a painting. For comparison the mural in Basel was 60 meters long and thus it would have been hard to miss. Finally it must (again) be remembered that when Douce so furiously defends this description of the painting in Whitehall, is it is chiefly because he believes it is helping to prove that Holbein didn't design the famous woodcuts: »it is to be hoped that no additional evidence will be requisite to shew that Holbein did not invent the subjects, nor execute the cuts belonging to the Dance of Death, which is usually ascribed to him«. Douce's logic is presumably that if it can be proved that Holbein had painted a dance of death in Whitehall, then it would explain much of the praise he was given by his contemporaries. This praise would then not be on account of the famous woodcuts, but the painting in Whitehall. There is something seriously wrong with this logic: He himself admits that Nieuhoff has copied one of the printed versions of Imagines Mortis, and Nieuhoff obviously did this because he knew (or guessed), that the two dances looked the same. 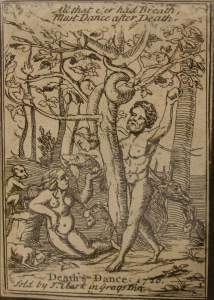 If Douce's only witness, Nieuhoff, had in fact seen the alleged painting, this would just be further proof that Holbein had designed the woodcuts. But as a matter of fact, Nieuhoff doesn't write anywhere that he has seen it himself: »It has been my good fortune to meet with that scarce little work of Hans Holbein neatly engraved on wood, and which he himself had painted as large as life in fresco on the walls of Whitehall«. Nieuhoff has seen Holbein's woodcuts: »neatly engraved on wood«, and he knows/believes that Holbein had also painted such a dance at Whitehall. But he doesn't write that he has seen it. Nieuhoff had no doubts that Holbein was the originator of Imagines Mortis: »a Dance of Death, painted by Holbein in its galleries, […] and even the little work which he has engraved with his own hand, and which I have copied as near as possible« and »that scarce little work of Hans Holbein neatly engraved on wood«. There was a great deal of Dutch persons at the English court in that period. King William III of England (1650 - 1702) was born in Holland. He was prince of Orange under the name Willem III until becoming English king in 1689 (it's a coincidence that he was the third Willem/William in both Orange and England). 1697 . . .: The fire took place 4 January 1698. England introduced the Gregorian calendar in 1752. Between 1155 and 1751 the new year started 25 March.